Notes: Dixon #17. Bar Rep. 24. Butler Doe Tor E - Vol. 2. Map 32.21 (diagram Vol. 5. p.198). Grinsell LYDFORD 12. Notes: Turner E24. "Cairn on ger tor, n side. 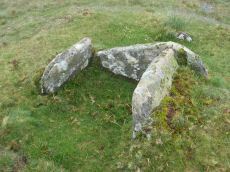 Platform circle with ring of kerb stones 4.6m internal diam, enclosing flat-topped cairn 0.2m high. Much disturbed (turner)." Notes: Butler Nattor Down 5 - Vol. 2. Map 32.2 (diagram Vol. 5. p.65). 127 Grinsell PETER TAVY 14. Lethbridge pp.11-12, photo and diagram p.12. Notes: Butler Vol. 2. Map 32, 22.10 (Cairn 10 - diagram of cairn cemetery on White Hill on p.107, diagram Vol. 5. p.217). Grinsell PETER TAVY 11. Lethbridge photo p11. Notes: Turner A11. Cairn field. Difficult to identify relevant HER record. The HER number (14428) linked gives a listing of the HER records of cairns in this area. The HER record 51457 gives the OS grid reference and description of 13 cairns. Turners A11 has internal diameter 13.2 m, width height 1 x 0.3m, G. Peter Tavy 9. Notes: Turner A8. NMR A. 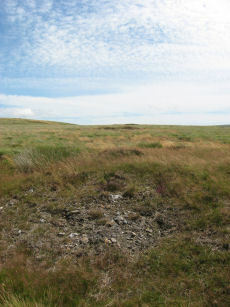 "Ring cairn 460 metres south-west of White Hill summit, forming part of the White Hill round cairn cemetery. This monument includes a ring cairn situated on a gentle west-facing slope overlooking Willsworthy Army Camp. 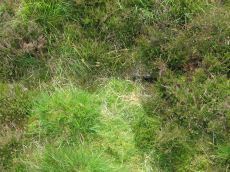 The earthwork appears as a raised internal platform measuring 15m in diameter surrounded by a circular bank 3.5m wide and 0.5m high. A shallow hollow in the centre of the internal area suggests robbing or partial early excavation. This cairn forms part of the White Hill round cairn cemetery." Cairn is part of an alignment of cairns, see photo.